Having a blocked ear due to hardened earwax can be very irritating. Dryness may occur, itchiness may add up, and worse is the pain. You can lose your sense of hearing due to this condition and it can ruin your performance in your job or any of your dealings with each day. Getting clogged earwax out of the ear canal can be the best solution and this is a clinical procedure only professionals can perform. Some experts use ear irrigation and some opt for ear syringing. With the perks of microsuction technology, this has now been utilized by the most highly qualified audiologists. There are people who sometimes try to do things on their own, yet most of the times; they end up just worsening the case. Do not be like them and entrust this condition to some trained individuals who will perform the entire procedures. You cannot just let any earwax (cerumen) block your hearing sense. Removing them with low pressure suction can give you so much comfort in just a few minutes of waiting. There is no need to keep going back to an audiologist since you will only be required to get a same day service. With a microscope worn by a trained specialist, with the medical suction device and with the help of some olive oils to save you from irritations and light pain, then the process of earwax removal can happen right away. This blockage in your ear will have its very smooth exit. Unlike any other process, with Microsuction technology, introducing the low pressure suction, there is no need for the whole procedure to be messy. In some cases, there is no need to use any fluid, which makes everything fast and clean. While on the other hand, a small ear irrigation process can also be used with the temperature of water that is same of your body’s. With the audiologists to use the necessary high-end equipment, they can have a better view of your ear canal, which makes them very comfortable and you will be very confident that the entire procedure will be very quick and smooth. The blocked ear will never experience any pain, which can sometimes add to the discomfort feeling. You will be at ease for the whole duration of the removal process. It will be a dry process, which is ideal for those patients with perforated eardrums. In just a few minutes, you can get back your hearing senses. 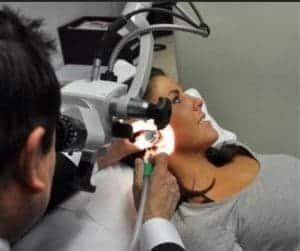 Just book your Microsuction London appointment and do not be afraid to submit yourself to some clinical procedures that are proven to provide you with the best earwax removal solution.